Not all foliage or bloom concerns are Virus-based. Plants "catch" a virus similar to the way we become victims to a head cold or influenza. Sucking insects, such as aphids, can transfer virus diseases from plant to plant and should be controlled in the garden. All garden-grown plants, whether lily, iris or tulips have one or more viruses present in the tissues. Trouble doesn't start until several different viruses find a home in the same plant. A plant can grow quite happily with one or two different strains of virus, but will begin to show streaking and twisting in the leaves, and eventual death, if several more strains are added. This is similar to an office worker functioning with a simple head cold, but add the flu... and we are in bed for days upon days. The flower shown is heavily infected with Tulip Color Breaking Virus, which is what causes the crazy markings on the old "Rembrandt" tulip mixtures from decades past. Regularly inspect your garden throughout the growing season, bearing in mind that some cultivars may have suspicious-looking foliage early in the season, but look great later. This is due to environmental issues, not virus. If in a group of recently planted lilies all look great except one, keep an eye on the one which looks unhealthy, but check for outside factors also. Mechanical damage to the sprout, insect activity, or competition from overly aggressive trees, shrubs or ground covers will all cause stress to the bulb. It is best to control aphids, and wait until early the next season before passing judgment on suspicious-looking foliage or flowers. Relocating bulbs to better-drained soil, adding humus, or providing trace elements will many times correct foliage concerns, plus improves flowering. Note: The old-fashioned Tiger Lily (Lilium tigrinum), with those tall, orange reflexed flowers, that were probably in your Grandmother�s garden, is heavily infected with viruses. Do not plant these with other hybrids; instead keep them isolated by at least 100 feet from other hybrid lilies to be safe. 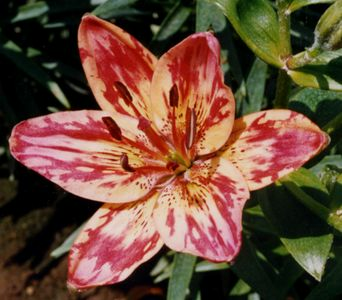 Lily producers consider L. tigrinum to be a 'Typhoid Mary' in the garden. True growers would never consider offering this Lilium species to their garden customers, because it is a ticking time bomb for virus.